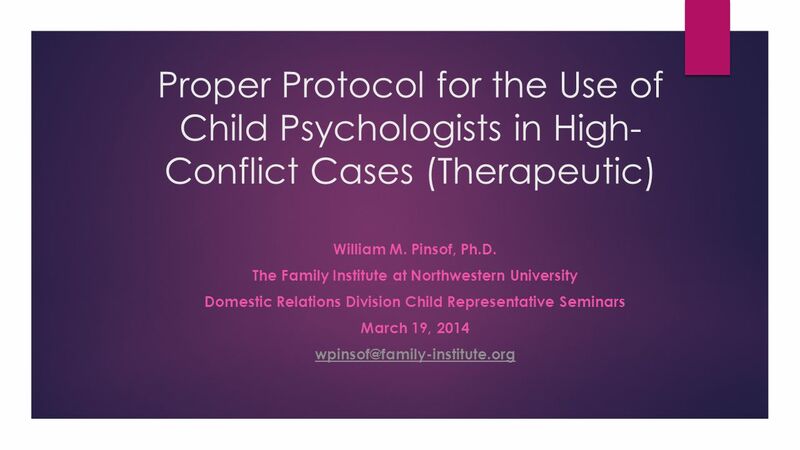 Proper Protocol for the Use of Child Psychologists in High- Conflict Cases (Therapeutic) William M. Pinsof, Ph.D. 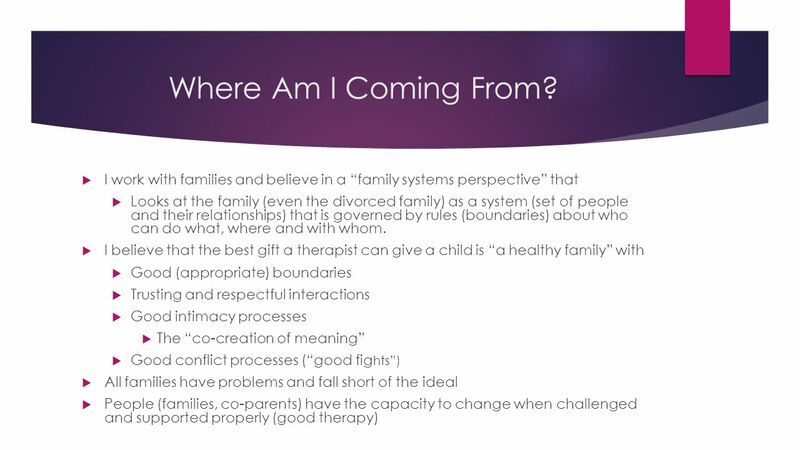 The Family Institute at Northwestern. 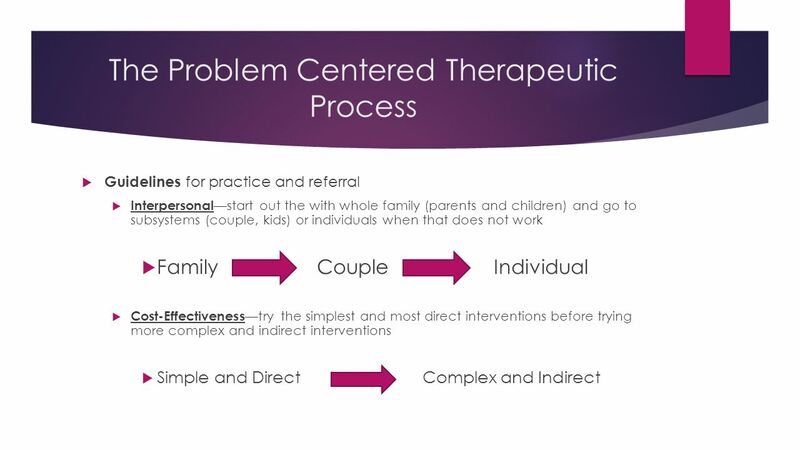 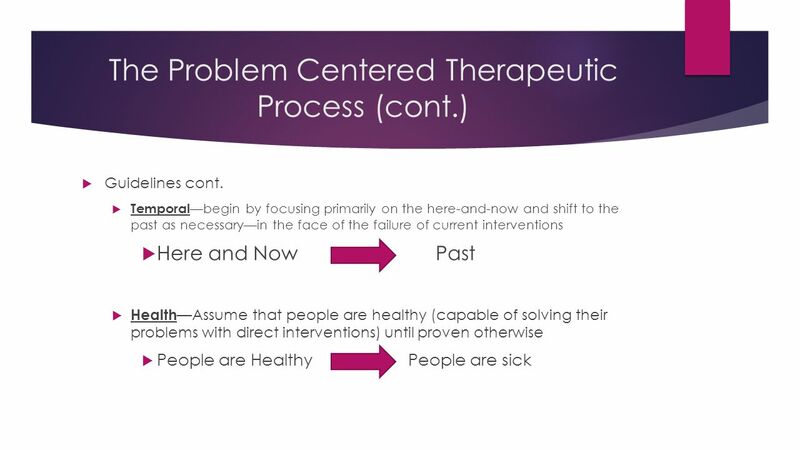 14 Steps in the Therapeutic Process (cont.)  Child focused constraint Interventions  Help the child evaluate the extent to which triggering or stimulating conflict  Preserves the pre-divorce “family”--brings mom and dad together  Engages a disengaged parent who would otherwise stay disengaged  Help the child grieve the “old family” that is gone  Help the child find healthier ways to engage a disengaged parent  Sessions with the parent can be very helpful in this regard  Help the child address his/her fears and feelings about each of his parents (“I can’t talk to my dad because he will get angry and I hate him”)  With impossible parents, help the child accept parental limitations—(“He will never be the father you want.” “Where does that leave you?”). Download ppt "Proper Protocol for the Use of Child Psychologists in High- Conflict Cases (Therapeutic) William M. Pinsof, Ph.D. The Family Institute at Northwestern." Mental Health - Mental health means generally accepting and liking oneself and adapting to and coping with the emotions, challenges and changes that are. Restorative Guide A very brief guide to introduce the principles and methods of a restorative approach. F AMILY T HERAPY Presented by: Sana Hamzeh Clinical psychologist Psychotherapist. Keeping Cool When Angry – Keeping Control in Conflict! Judicial Affairs Education Session Series. Jocelyn, Rachael, Steve, Todd, Sarah, Jordan and Paul. PARENTS ARE MODELS Parents are the most important people in their children’s lives. Children want to be like their parents and do what their parents do. © 2001, Jack Arbuthnot, Ph.D.1 High Conflict Parents What Can You Do? 1 Illinois Office of Mental Health Metro C & A Network Teen Advisory Council Presentation To President’s New Freedom Commission September 11, 2002. Al-Anon Family Groups OUTREACH TO PROFESSIONALS: EDUCATION All About Al-Anon FOR EDUCATORS. Helping Children Develop Healthy Attitudes Toward Stuttering J. Scott Yaruss, Ph.D. Stuttering Center of Western Pennsylvania University of Pittsburgh.